I snapped this photo a few weeks ago: the last local peaches of the season. Beautiful, round, sweet and especially juicy, probably because of September’s unseasonably warm weather. And I was determined to savor them. I feasted on one peach leaning over the sink. Half of another in a smoothie. The last one cut up with greek yogurt, honey and walnuts. Yum! Lovely memories. 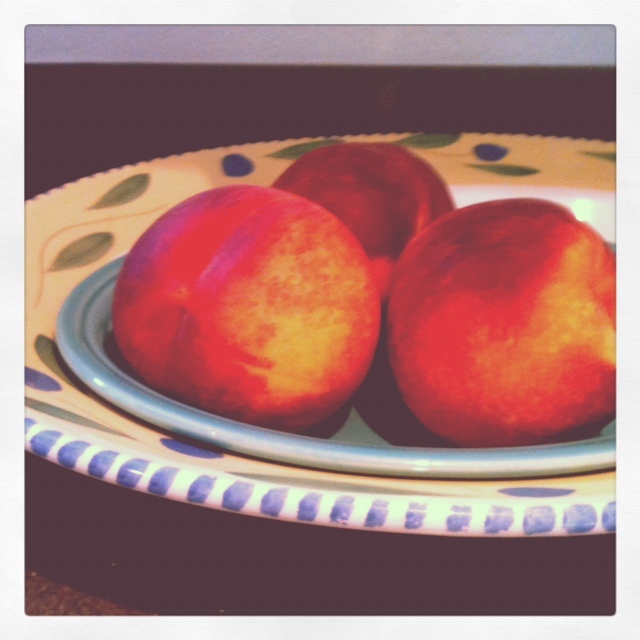 Without a doubt, the best last peaches of the season. Ever. We often talk about savoring the first of things, but not as much about the last. Maybe that’s because there’s something particularly tender and bittersweet about savoring the last. That kind of savoring invites us to appreciate things that won’t come again for a long time. Or perhaps ever. But there’s room for more of this in all of our lives. It’s pretty easy to relish such delights, isn’t it? What if we took a bigger step, though, and committed to savoring the last of things that aren’t so pleasant? For me that means I’ll be attempting to savor this final week before we elect our next president. I tend to get very worried and anxious during election season, so my natural instinct is to just want it to end. But then I’d be racing ahead with my life, wouldn’t I? Forgetting to live right here, right now, with whatever is present. So that’s one way I’ll stretch my savoring muscles this week. How about you? You might have noticed that I tweaked the name of my new site. It’s now Living Deep Studio. I’ve also redirected everything here, including my old blog, Why Not Start Now? If you’re new here or you’re subscribed to receive posts from WNSN by email or reader, I’d be so grateful if you’d click here and sign up for this site. Thanks! Love the living deep studio – and I do try living present as well as deep! My mouth was watering as you described those peaches. Ah yes, do savor! Savor it all! The end of the campaign. I hate elections. I vote, but I’m fond of the fight. The end of a wonderful night full of friends and friendship…lingering with my best friend afterwards on the porch to savor the time. The end of great meal….which reminds me I NEED TO EAT. btw ..the picture is LOVELY…you should frame and then you savor it again and again. You’ve reminded me how much I love the end of gatherings, Sara. When only a few people are left and there’s that delicious bond! I love this post! You’re right – it’s all about savoring the little moments.